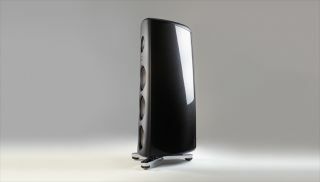 Magico M6 floorstanding speakers cost £200,000 a pair | What Hi-Fi? PLEASE NOTE: When we first reported on these speakers on May 12th, we gave the UK selling price as £130,000. That turned out to be an underestimate on our part, for which we apologise. If you're selling your flat, and are looking for something to spend the cash on, maybe these awesome floorstanding speakers will take your fancy. The Magico M6s cost a whopping £200,000. Why? Well the materials and build quality have something to do with it. They're encased in a six-sided carbon fibre monocoque enclosure that's similar to the shell of an F-35 fighter plane. Magico says that by using the latest aerospace materials and technologies, it's been able to increase the strength-to-weight ratio by a factor of 60, while reducing the weight by 50 per cent and making them 30 per cent smaller, and all without compromising on the internal volume. The curved interior and exterior walls also minimise internal standing waves, and eliminate external diffractions, aiding sound quality. How is this achieved? Four huge aluminium billets have been machined to form a continuously curved exterior with no angles. The drivers are supported by a thick-machined aluminium inner baffle, while the enclosure is further stiffened by 10 aluminium extension rods that extend front to back. The M6s boast a more efficient version of the tweeter found in the M-Project, which Magico unveiled in 2014. They have a 28mm diamond-coated beryllium diaphragm, while the new 6in midrange driver features Magico's Graphene-based cone material which is 30 per cent lighter and three times stiffer than its predecessor. For more info, check out the promotional video, or head to the Magico website.